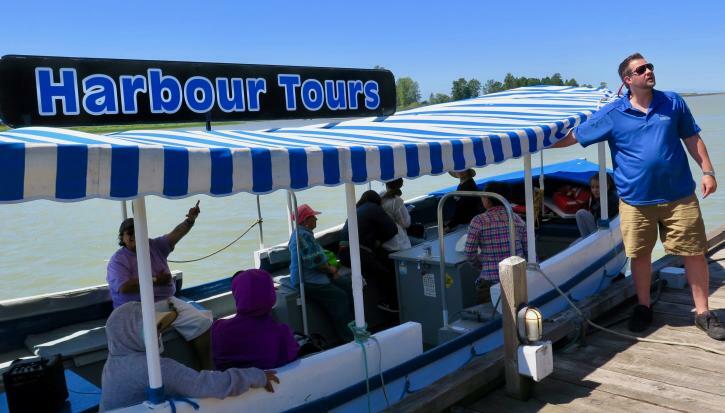 Welcome aboard the famous "River Queen" for a leisurely and fascinating 45 minute, fully narrated nature and historical tour of Steveston and Cannery Channel. See the historic commercial fishing fleet in Steveston as you glide past Shady Island and the old fish canneries. See seals, eagles, herons, swans, cormorants and more. Group rates and flexible departure times available. We welcome school groups and seniors groups. Boat capacity 12 passengers. Please call to reserve for Group Bookings. Climb aboard the historic “River Queen” for a fully narrated nature and history tour of Steveston’s waterfront. Stops include Fisherman's Wharf and the Britannia Shipyards National Historic Site where you can hop off the vessel and enjoy a tour. Tickets can be purchased on the River Queen or at the Vancouver Whale Watch sales kiosk (cash only). Please call 604-274-9565 for more details. The vessel has a maximum seating of 12 passengers and may be closed due to weather. Some accessibility limitations exist due to the nature of the vessel. Tickets may be purchased in advance (cash only). All ticket prices include tax. Tickets are non-refundable and are only valid for Sundays of the current season: July 9 - September 3, 2018.